New York Art Blogs List. The Best New York Art Blogs from thousands of New York Art blogs on the web using search and social metrics. Subscribe to these websites because they are actively working to educate, inspire, and empower their readers with frequent updates and high-quality information. 2.13 Art F City | New York art news and reviews. New York Art newsletter is a comprehensive summary of the day's most important blog posts and news articles from the best New York Art websites on the web, and delivered to your email inbox each morning. To subscribe, simply provide us with your email address. New York City About Blog Art Observed covers contemporary art globally from a New York City perspective. We intend to provide a selective, editorialized, curated perspective on the fine art arena including the trends and forces that drive the market. Facebook fans 7,297. Twitter followers 152,113. Brooklyn, NY About Blog Contemporary art space located in the heart of Williamsburg, Brooklyn specializing in pop-culture, gig and alternative movie posters. Facebook fans 31,942. Twitter followers 15,103. New York About Blog Brooklyn Street Art is a resource for fans and friends of the dynamic and explosively growing street-art and graffiti scene in New York. It supports the arts, the artist community and the creative spirit, and we always encourage people to respect the property of others. Facebook fans 232,521. Twitter followers 45,170. New York About Blog Art21 was founded in 1997 with the mission to increase knowledge of contemporary art, ignite discussion, and inspire creative thinking by using diverse media to present contemporary artists at work and in their own words. Facebook fans 514,167. Twitter followers 190,042. New York City About Blog Follow us to keep up with articles from Haberarts. It features art reviews from around New York city. New York City About Blog The Arts section of The New York Times Cultural news and reviews from our critics and reporters, including coverage of visual art, books, dance, movies, music, television and theater. Facebook fans 16,237,169. Twitter followers 41,752,796. New York, NY About Blog Art21 was founded in 1997 with the mission to increase knowledge of contemporary art, ignite discussion, and inspire creative thinking by using diverse media to present contemporary artists at work and in their own words. Facebook fans 514,030. Twitter followers 190,081. Brooklyn, NY About Blog The Textile Arts Center provides artists, working professionals, students, and artisans with the tools for making and sharing fiber art in their work space. It aspires to empower and unify the textile community, and advocate for the handmade. Facebook fans 19,559. Twitter followers 10,598. 13. Art F City | New York art news and reviews. Brooklyn, NY About Blog Art in New York City promotes the work of local artists and art events. Facebook fans 307. Twitter followers 2,329. New York About Blog Blog by Master of 3D Pop Art Charles Fazzino. He is a graduate of the School of Visual Arts in New York City & is one of the most popular and highly-collected pop artists of all time. During his more-than-thirty years as a pop artist, he has inserted his unique, detailed, vibrant, and three-dimensional style of artwork into the very fabric of popular culture. Facebook fans 101,367. Twitter followers 2,640. New York About Blog The Grey Art Gallery is New York University's fine arts museum, located on historic Washington Square Park in New York City's Greenwich Village. New York City About Blog Committed to innovation, the Solomon R. Guggenheim Foundation collects, preserves, and interprets modern and contemporary art, and explores ideas across cultures through dynamic curatorial and educational initiatives and collaborations. With its constellation of architecturally and culturally distinct museums, exhibitions, publications, and digital platforms, the foundation engages both local and global audiences. Facebook fans 821,494. Twitter followers 3,558,614. New York About Blog The Rubin Museum of Art is a dynamic environment that stimulates learning, promotes understanding, and inspires personal connections to the ideas, cultures, and art of Himalayan Asia. Facebook fans 76,947. Twitter followers 151,404. New York City About Blog The Art Studio is a nurturing, inspiring and relaxing spa-like art school that welcomes all people of all ages and backgrounds to express their true selves. Through our unique approach to artistic creativity, our clients tap into their authentic self-expression. When we express our true selves, we naturally inspire others to do the same. Facebook fans 8,228. Twitter followers 1,495. New York, NY About Blog Celebrating artists who explore the intersection of arts & climate change. Artists & Climate Change is a blog and international network that bring together artists working at the intersection of arts and climate change. It is an initiative of The Arctic Cycle. Facebook fans 9,582. Twitter followers 975. NYC About Blog Follow us to keep up with the leading digital platform for the artworld. Facebook fans 1,267. Twitter followers 2,140. New York, NY About Blog New York arts is an international journal for arts. Follow us to keep up with articles from New York Arts. New York City About Blog Arte Fuse is a contemporary art platform focused on art shows which are currently on display, interviews and studio visits. Facebook fans 6,030. Twitter followers 5,821. New York City About Blog The Center for Italian Modern Art (CIMA) was established in 2013 in New York City to promote the study and appreciation of modern and contemporary Italian art in the United States and internationally. Facebook fans 4,527. Twitter followers 2,443. Brooklyn, NY About Blog Art In Brooklyn was founded by Michael Sorgatz to promote the work of local artists. Facebook fans 344. Twitter followers 2,329. New York, USA About Blog The Curious Frenchy is the blog of French artist Laurence de Valmy. Along her way, she had the chance to meet many passionate and inspiring persons who can be either entrepreneurs, artists, bloggers, chefs. Facebook fans 387. Twitter followers 1,069. New York, NY About Blog The Met presents over 5,000 years of art from around the world for everyone to experience and enjoy. The Museum lives in three iconic sites in New York City—The Met Fifth Avenue, The Met Breuer, and The Met Cloisters. Millions of people also take part in The Met experience online. Facebook fans 1,939,635. Twitter followers 4,375,681. New York City About Blog Frank Lloyd Wright's architectural masterpiece the Guggenheim Museum is home to a world-renowned collection of modern and contemporary art. 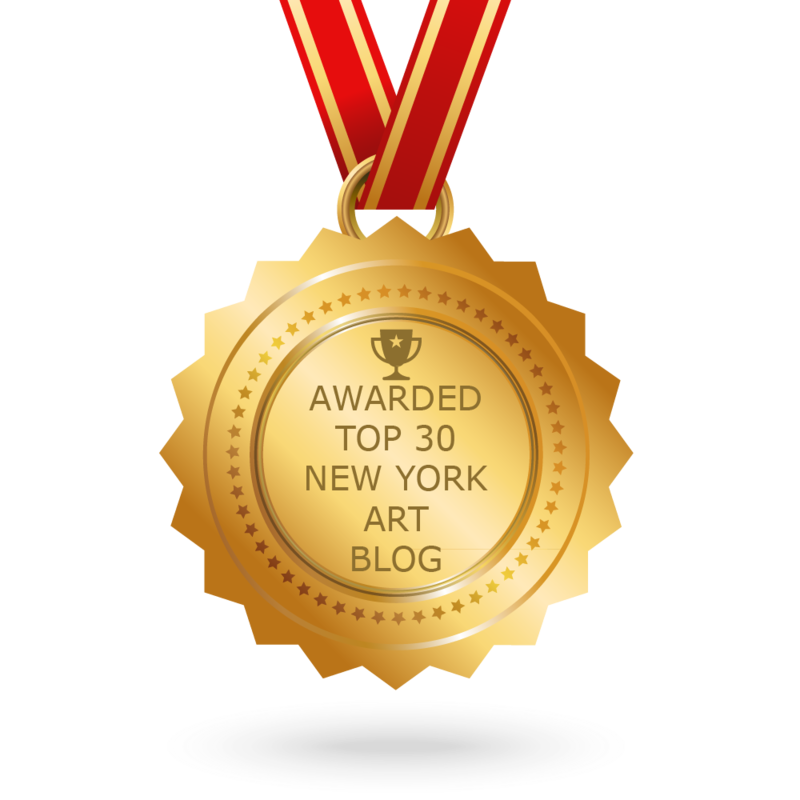 CONGRATULATIONS to every blogger that has made this Top New York Art Blogs list! This is the most comprehensive list of best New York Art blogs on the internet and I’m honoured to have you as part of this! I personally give you a high-five and want to thank you for your contribution to this world.